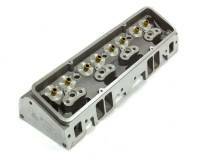 Flo-Tek manufactures aluminum cylinder heads for big block Chevys and small block Chevy and Fords. Each head comes preassembled with valves and springs. In 2005, Tri-State Cylinder Head began research and development of the FLO-TEK High Performance Aluminum Racing Heads. Introduction of the FLO-TEK Cylinder Heads were in production by 2007.